To prepare the avocado mousse: In a small bowl, combine the gelatin powder and water, at room temperature. Let rest a few minutes. Microwave for about 20 seconds, and stir with a spoon until the powder is completely dissolved. Set aside. In a food processor, process the avocado with the cream cheese, mayonnaise, lemon juice, Worchester sauce, salt and pepper, to taste. Add the gelatin mix and thoroughly combine. Pour the mousse mix into different molds. Cover with plastic wrap and refrigerate 4 hours, or, time permitting, overnight. Keep in the molds until you're ready to serve. To prepare the shrimp: In a bowl, combine the shrimp with salt, pepper and garlic. Cover and let marinade in the refrigerator for at least 1 hour. Heat the grill or a heavy frying pan over medium heat. If cooking on the stovetop, pour a few drops of annatto oil in a frying pan and cook the shrimp on 1 side for 2 minutes before flipping and cooking for an additional 2 minutes. Remove from heat. 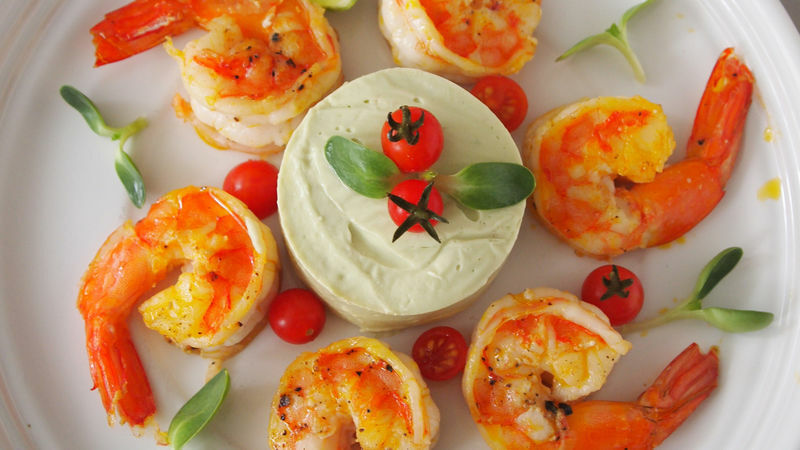 For garnish, to taste: Arrange the shrimp around the avocado mousse on each plate. Garnish with cherry tomatoes, sunflower sprouts and lemon wedges. Pair with tostaditas and sprinkle olive oil over the top of everything. Serve immediately. Swap out the mayonnaise for natural Greek yogurt. Use any aromatic herb, such as parsley, chopped coriander, dried watercress or fresh oregano leaves in place of the sunflower sprouts. *To make the annatto oil: heat 1/4 cup vegetable or olive oil and 1 teaspoon annatto seeds in a small frying pan over low heat. Little by little, the oil will turn red. Remove from heat when the oil has taken on a beautiful color, and let cool. Shrimp is, without a doubt, the preferred seafood of the United States and in many other countries. Surely the flavor and versatility of this ingredient, which can be used in a number of different dishes, contributes to its popularity. I've combined two of my favorite ingredients in this dish: shrimp and avocado. This avocado mousse can be used in multiple dishes. An additional benefit is that it can be prepared ahead of time. I like to keep it simple, using just a few ingredients and omitting egg, although I think a little gelatin gives it the necessary body to be perfectly molded. Let this recipe inspire you and prepare it for a nice Sunday lunch. Then, let us know what you thought of the recipe and how it turned out for you. Remember to always add your own special touch to make it uniquely yours!